A Total Coverage, which was folded into What’s Next Inc., on March 1, 1993, expanded into landscaping and became a full-service outdoor-improvement company operating in The Woodlands, Oak Ridge and Magnolia and secured contracts with noted properties such as The Showcase of Homes in Hollymead and Windward Cove as well as the Black-Eyed Pea on Lake Woodlands through the 1990s. In the process, Bryan Stuart started to develop an interest in swimming pool design, construction, and development. 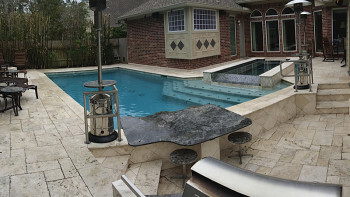 The launching point of the Ultimate Pools that exists today started in the winter of 2000, as Stuart designed a pool for his next-door neighbor in The Woodlands. That turned into a second pool in Hayden’s Run in 2001, setting the stage for Ultimate Pools to emerge on the scene in 2002 with 11 completed pools. 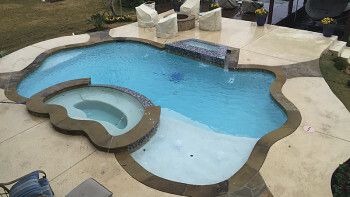 Although the business has expanded in the years since, resulting in over 200 pools designed and constructed in Greater Houston since that first pool, the mission of Ultimate Pools is exactly the same now as it was in the beginning. Ultimate Pools believes in personalized, detailed service to its customers and believes that attention to detail makes the difference in making your swimming pool great. That attention to detail is why you won’t see Ultimate Pools advertise on a grand scale. 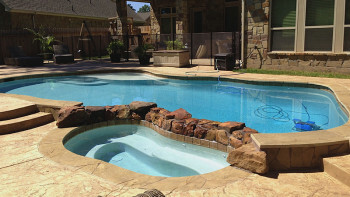 Ultimate Pools prides itself on developing and maintaining personal relationships with its customers, both in developing cutting-edge pool designs, pool construction, and a pool’s post-completion maintenance and upkeep. We believe in keeping our customers for life and that our attention to detail will not only make the difference in the enjoyment of your pool, but in your willingness to refer us to your friends and loved ones. Ultimate Pools also prides itself on its close relationship with the community. We have been a big supporter of Montgomery County and Northern Harris County schools and organizers, donating the clean, ozonated water we put in our pools for organizations to sell as drinking water for charitable and fundraising organizations. Along with providing donations for the Shenandoah Sharks Swim Club since 2004, we have provided water for the Lions Club, The Woodlands Children Museum and donated water to be sold at The Woodlands College Park High School’s graduation at Cynthia Woods Mitchell Pavilion from 2009-2014. Ultimate Pools has worked with the Knox Rox spring fundraiser at Knox Junior High School and provides water and sponsorship for sports teams at College Park (volleyball, band, basketball, baseball, football and girls’ soccer) and The Woodlands High’s girls’ soccer team as well as Magnolia High cheer. We have also donated water for fundraisers at College Park, Knox, Collins Intermediate, the Springetti Around the World event at Galatas Elementary and fundraisers at Sally K. Ride Elementary School. David’s Dream Run sponsored by David Elementary is an annual event Ultimate Pools humbly supports. If you want to find a printed ad you can only do so in The Woodlands Interfaith Directory and PTO Student Directories. Again, the goal is to support our community. 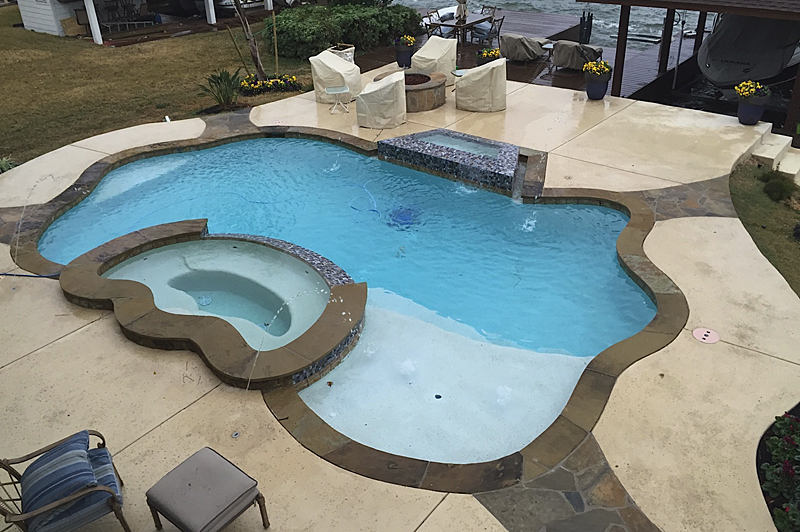 While our main area of service is The Woodlands, Magnolia, Oak Ridge, Tomball, Conroe, Willis, Lake Conroe, Spring and Montgomery, Ultimate Pools will venture all over Greater Houston to provide our personalized brand of swimming pool design and construction. 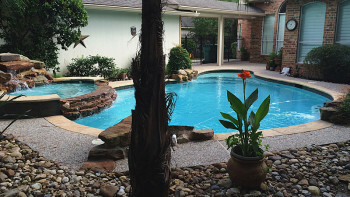 We have built pools for customers in places such as Baytown, Cypress, Humble, Bellaire, Atascosita, West University, and the city of Houston, along with our local communities. Ultimate Pools considers it an honor to be invited into your home and build an oasis that you can enjoy for years to come. Feel free to call (936-321-9632) or visit us (5710 FM 1488) at our Magnolia office, e-mail us or visit us on Facebook!